The novel catalyst is a nanostructured composite material composed of carbon nanowires with ruthenium atoms bonded to nitrogen and carbon to form active sites within the carbon matrix. Electron microscopy of the composite material shows ruthenium nanoparticles decorating the surface of the nanowires. Image: Lu et al., Nature Communications. A novel ruthenium-based catalyst developed at the University of California (UC) Santa Cruz has shown markedly better performance than commercial platinum catalysts at alkaline water electrolysis for hydrogen production. The catalyst is a nanostructured composite material composed of carbon nanowires with ruthenium atoms bonded to nitrogen and carbon to form active sites within the carbon matrix. At UC Santa Cruz, researchers led by Shaowei Chen, professor of chemistry and biochemistry, have been investigating catalysts made by incorporating ruthenium and nitrogen into carbon-based nanocomposite materials. Their new findings, reported in a paper in Nature Communications, not only demonstrate the impressive performance of their ruthenium-based catalyst but also provide insights into the catalytic mechanisms involved, which may lead to further improvements. 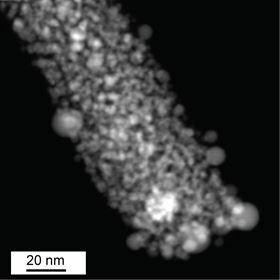 Electron microscopy and elemental mapping analysis of the material showed ruthenium nanoparticles, as well as individual ruthenium atoms, within the carbon matrix. Surprisingly, the researchers found that the main sites of catalytic activity were single ruthenium atoms rather than ruthenium nanoparticles. Lu worked with co-author Yuan Ping, assistant professor of chemistry and biochemistry, to perform theoretical calculations showing why ruthenium single atoms are more active catalytic centers than ruthenium nanoparticles. Chen said he has filed a patent application for the experimental preparation of ruthenium-based catalysts. He noted that, in addition to potential applications for hydrogen production as part of sustainable energy systems, alkaline water electrolysis is already widely used in the chemical industry, as is a related process called chlor-alkali electrolysis for which the ruthenium catalyst could also be used. Thus, a large market already exists for cheaper, more efficient catalysts. The electrolysis of water to produce hydrogen can be carried out under either acidic or alkaline conditions, and each approach has advantages and disadvantages. Platinum catalysts are much more effective in acidic media than they are in alkaline media, but ruthenium-based catalysts perform almost as well as platinum in acidic media while outperforming platinum in alkaline media, Chen said. In future work, the researchers will seek to maximize the number of active sites in the material. They may also investigate the use of other metals in the same nanocomposite platform, Chen said. This story is adapted from material from the University of California Santa Cruz, with editorial changes made by Materials Today. The views expressed in this article do not necessarily represent those of Elsevier. Link to original source. Quick, split and make hydrogen from water.